You’ve probably seen me posting about it this week on Twitter and Facebook, but I didn’t want the week to end without officially blogging about the work I did recently on Dear Friend! This project was unique because Anna came to me with a layout that she’d designed herself when she hired me, so from there I developed the layout into a theme, and we just tweaked things from there! Anna is amazing- I love following her blog, and her Instagram feed is equally beautiful! And I just adore the header and calligraphy she had commissioned from joliemade. Make sure you check out the blog for yourself, I love the feature pages Anna has put together! 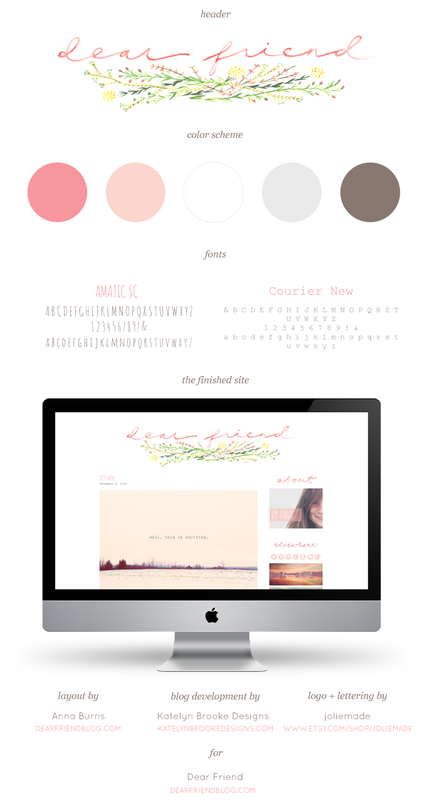 I really loved Anna’s new blog design when I saw it debut this week! you three made for such a great collaboration. Ahh! I am so IN LOVE!!!!! Thanks again for all your help Kate! YOU are amazing! I love seeing these collaborative projects! They always come out amazing!